We are producing 35 types of fruit and vegetable in 13,500 decares farms set up in Turkey’s various regions.. We produce our farm products based on the cold chain and fifo principles using advanced technology machine park in our factories with a closed area of 110,000 m2 in 5 different regions. Çekok Gıda minimizes the risks that may arise due to adverse conditions by establishing factories which would be alternative for each other at different points in the country. Besides, we have established factories close to our customers with our contracted farmers in order to ensure that fruits and vegetables produced are always fresh and reach your table as soon as possible. 65 years of experience and responsibility. It is a well-established company that has established production facilities in accordance with its dynamic structure and developing world trends and has made a distinguishable name for itself in Europe and in the world, thanks to a number of innovations it made on behalf of sustainable agriculture in logistics and production. Having never lost the concept of "people first" since the day it was founded 65 years ago in Mersin, Çekok adopted the principle of customer satisfaction and sustainable quality at every stage. 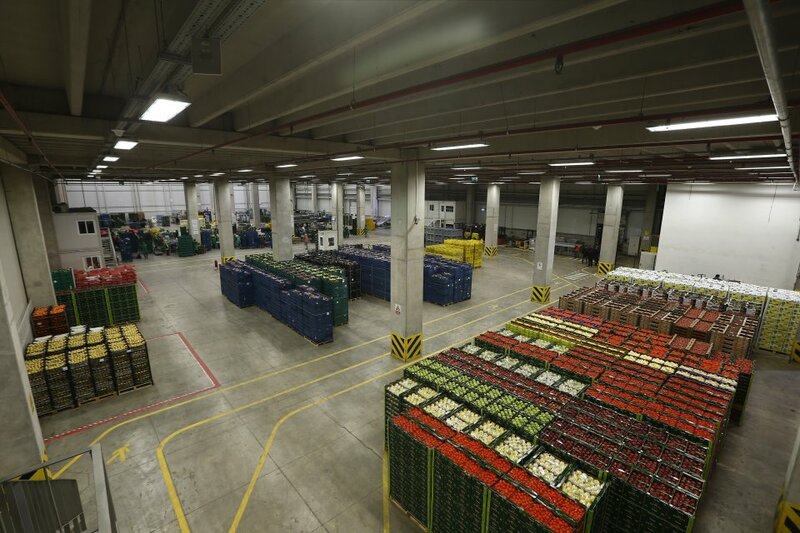 It ensured that fruits and vegetables produced are always fresh and reach people as soon as possible, in particular, thanks to its innovations in packaging technology, its centralization studies, ERP technology which provides instant follow-up of the products at their growth stage and the refrigerated vehicle fleet consisting of 180 trucks. Without compromising its exemplary quality policy at all stages of production, it modernized its production facilities with the latest technology to offer its customers fresh and natural fruits and vegetables in world standards. Becoming one of the few important producers in Europe and in the world, Çekok has never lost the production discipline and the producer spirit and has carried out all the innovation work together with its farmers. Among all these innovations, the only thing that did not change in Çekok was its responsibility towards human and nature. 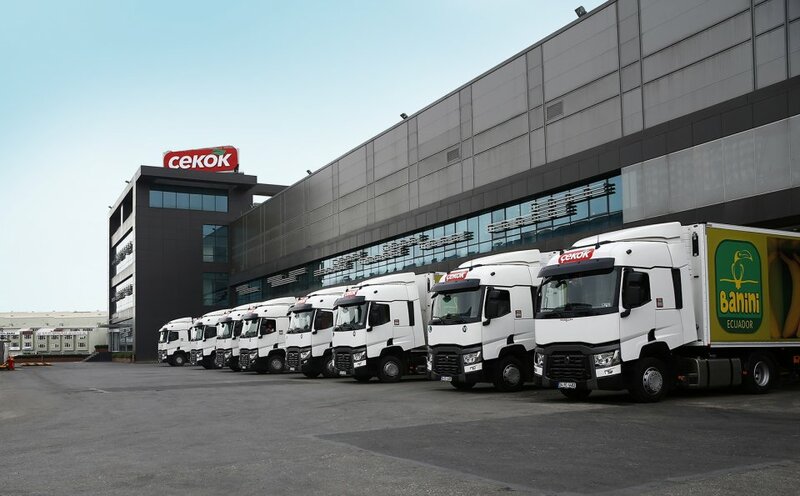 Cekok has expanded its marketing network by making exports to Europe and then to many of the world's central points with the distribution warehouses it established in Ukraine and Bulgaria in the nineties and has become one of the world's leading producers. 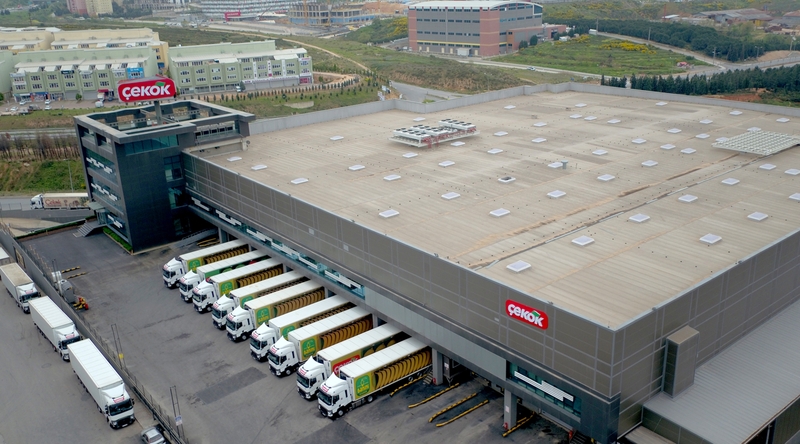 Having the second largest kiwi production area in Europe and the fifth largest in the world, Çekok is among Turkey's top 500 industrial enterprises today and is ranking higher levels each passing day. 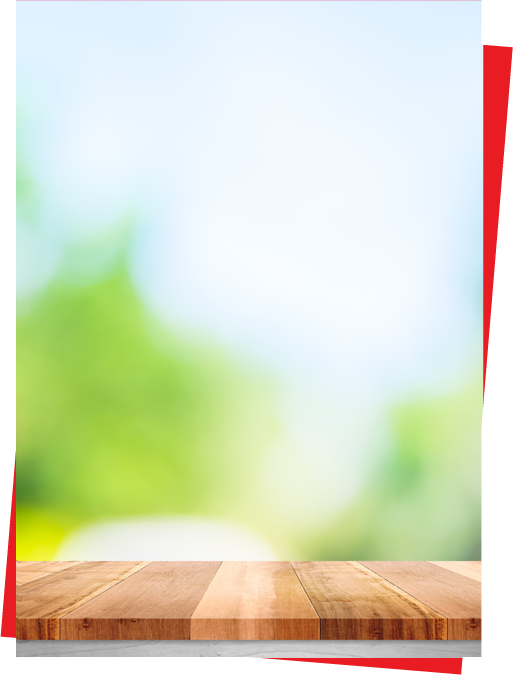 Çekok will continue to produce healthy and fresh products and to reach these products to your tables without harming the environment and nature by introducing innovations to the industry with the determination it shows on the day it was established. 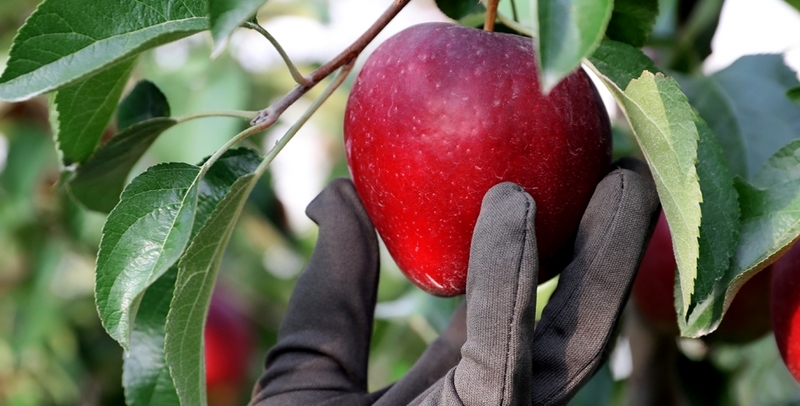 We believe that a company's production must have food safety, traceable product characteristics, good production strategy, sustainable farming approach, plant protection policy and discipline for suitable procedures in order to have the highest quality. We believe that the indispensable part of perfect service understanding in fruit and vegetable production is possible through the disciplined work of specialists in every field of production. Accordingly, with our staff of specialists, we serve you by maintaining the excitement and the discipline that we had on the very first day throughout every stage until the products reach your table from our farms. At Çekok Gıda, we meticulously examine customer satisfaction index (TMME) and we constantly renew and shape all our products and services in line with the demands and needs of the consumers. In accordance with this, we strive to develop new tools to improve quality and productivity at every stage of our production processes. Along with the rapid development and change in this age, consumers determines the future of the food industry with their choices. The consumer expectations are an important reference point for conscious producers. To be able to continue their operations in the future, producers need to understand their consumers and respond to their needs and expectations. At Çekok Gıda, we understand needs and expectations of today's and tomorrow's customer profile by adopting a producer model that meets customer expectations in the best way, addresses environment and nature in a sustainable approach, takes into account the elements of respect, responsibility, trust and value/quality/price balance and is easily accessible. The conscious consumers of today and tomorrow, at first, wants the product they purchased to fully satisfy their needs. Secondly, they pay attention that the product or service price is proportional to the value added. Then, they do not want to pay more money for the same quality product or service. Today and tomorrow's consumers want to reach the authorities of the producer firm within a reasonable period of time in case of any problem with the product and service purchased. That is why, at Çekok Gıda, we regard easy accessibility as our basic principle. Thus, we establish a strong trust between us and our customers. 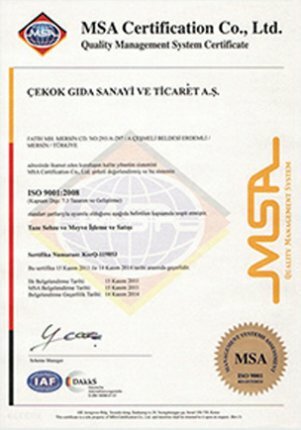 Çekok Gıda prefers a production policy that has awareness for social responsibility and shows a fair sense of management approach respecting not only its customers but all its workers and their working rights, with its transparent producer profile respectful towards environment, nature, and human. Each person is responsible for the neighborhood they live in. This responsibility is very important in terms of ecological balance and protection of nature. As Çekok, we are conscious of our responsibility towards human and nature, for every product produced for human at our units, particularly at our production facilities. At Çekok, we believe that new perspectives and concepts need to be developed in order to introduce to our industry cost-cutting novelties suitable for market dynamics that goes through social, cultural, technological and economical changes. It depends on successful innovation. The basic rule for a true innovation management is to be able to manage the change well. We believe that the most important element that enables this is the quality communication between all units and R&D studies. We are aware of the benefits that the innovation at every step of the production bring for the production quality standard. That's why we continue our discipline in innovation, which is a part of our success, since the first day of our establishment. 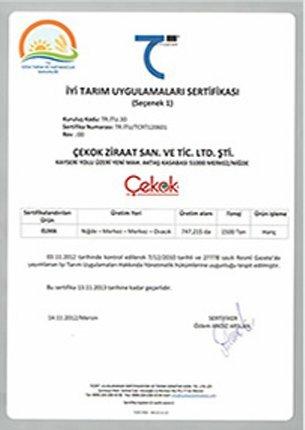 As Çekok Gıda, we ensured the quality of production without damaging the environment, especially with nature friendly irrigation techniques and automatic dosing system in pesticide and now we are one of the pioneering producers to defend the necessity of sustainable agriculture. In the field of logistics, we have provided energy saving by centralizing distribution centers in order to be sensitive to environmental effects of carbon dioxide emissions and fuel consumption and we have directly served for the sustainability policy with a significant reduction we made possible in transportation movement. 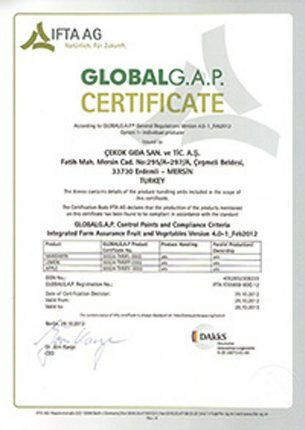 Our experience and sensitivity in the production business has positioned us among distinguished producers in Turkey and in the world. We believe that the only reason for this is our understanding of service that centers on human and human values together with our employees.